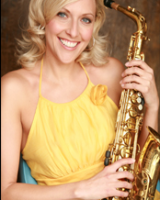 Michelle Grzanna is a composer, Jazzsaxophonist, vocalist and music teacher. She teaches piano, voice, saxophone,flute, and clarinet. Michelle has a Bachelor of Fine Arts in Music Education with two certifications in Instrumental and General Music K4-12th grade from the University of Wisconsin Milwaukee. Ms. Grzanna started learning music at the age two with violin and shortly after she, started piano lessons. Michelle Grzanna later joined the family band as a vocalist. She performed with her mother, brothers and sisters all over the Milwaukee area starting at a very young age.Michelle started recording in the studio in Australia during her tour with the UWM Wind Ensemble and Symphonic Bands. She then recorded her next CD in a big band style called “Playing Hardball” with the UWM Jazz Ensemble. Ms. Grzanna performs for various events such as clubs and private parties in a jazz combo style. Michelle has been teaching privately since 1996 and has been teaching at Wondersound Music since 1997. Michelle is comfortable teaching all ages from preschoolers to adults.